Saturday. 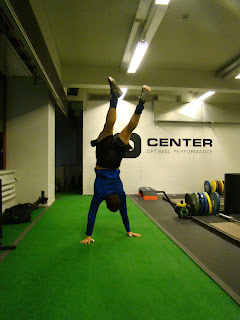 Skills, Bar muscle-ups, Ring muscle-ups, handstand. Today was nothing scheduled on my program so it was more like a play day. Worked on some skills and just had fun fooling around. Pauliina was doing push presses so it was awesome to be there to support her. Haven't done my homework on the muscle-ups lately. It feels like an eternity since I've done those previously. I had planned on doing only ring mu's but the rings were taken in the beginning so I jumped on the pull-up bar and started ripping it. Took only one set for 10 reps. That was a bit tight in the end but surely some more reps might be in the tank. At home I realized that happens to be my PR number. I've taken it once last fall. Ring mu's were doubles every minute for 5 minutes. Felt good on those too. Handstand (walk) is something I could put more effort now as the surroundings are perfect. That grass matt is awesome for training being inverted because it's so flat.